We give scores for our reviews. We do it because it gives the reader something tangible to hold on to, and because it's fun. But it also presents a specific problem that I often struggle with--namely, how "universal" are our scores? Is an 8/10 always an 8/10, or are some worth more than others? Do our scores reflect some universal metric that can/should be applied to all books/films/games/comics equally, or are they inherently situational? Take this comparison of book reviews: in June 2012 I gave Haruki Murakami's bloated spec/lit crossover 1Q84 a 6/10; in May 2013, I gave Doug Hulick's thrilling crime fantasy Among Thieves an 8/10. But is Among Thieves "better" than 1Q84? The reviews present no mystery as to which book I enjoyed more--1Q84 was, to me, a frustrating and disappointing read, whereas Among Thieves was memorable in all the ways you want genre fiction to be. I tell anyone who will listen to avoid wasting their time on 1Q84, while I frequently evangelize Among Thieves to those looking for quality fantasy. At the same time, these books have fundamentally different ambitions. 1Q84 wants to be high-art, and despite its flaws, does achieve that from time to time. Among Thieves, by contrast, is aimed squarely at your entertainment sensors. I see a lot of value in that--I read a lot of entertainment fiction, and enjoy it when it does its job well. And the score I gave Among Thieves reflects the fact that it accomplishes what it sets out to accomplish to a very high degree. 1Q84, simply put, does not. In fact, if I were to review the book again, I'd be inclined to drop the score down to a 5/10. So yes, 8/10 does still trump 6/10--regardless of situational differences. In other words, I'm still picking Among Thieves over 1Q84. But what happens if I have to pick between a literary fiction 8/10 and an entertainment fiction 8/10? Let's throw Marcel Theroux's horror/spec/literary/mystery mashup Strange Bodies into the mix. In March 2014, I gave it an 8/10--just like Among Thieves! Yet while Strange Bodies is also qute entertaining, Theroux's ambitions are primarily literary. The crucial difference with 1Q84, of course, is that Strange Bodies accomplishes what it sets out to accomplish. But is this 8/10 the same as the other? In a word, no. Doug Hulick has written an immensely likable novel, but it simply isn't trying to accomplish the same things as Strange Bodies. Hulick's prose is strong, but Theroux's is poetic. And while Among Thieves is expertly plotted, Strange Bodies explores new territory for plotting. In the end, it's a bit like comparing a very nice apartment building to Calatrava's Turning Torso. That's not a snooty dig at fantasy or other forms of entertainment-first literature. 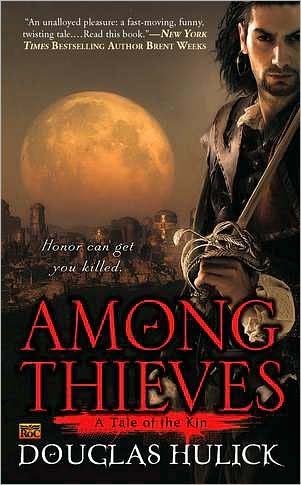 I really like Among Thieves, and suggest you go read it if you haven't already (especially now that the second volume is out). And I don't think literature has to have high-art ambitions to be successful or "good." In fact, I think Among Thieves and Strange Bodies are equally successful at what achieving what they set out to achieve, hence the identical scores. Besides, the Turning Torso is pretty cool to look at, but would you really want to live in it? I'd probably prefer the little blue one next to it. I guess what this all goes to show is that the scores we give do not reflect universality or situationality, per se, but rather a compromise between them. An 8/10 is an 8/10 until it's more or less than the other one. And I've come to terms with that.